Marathon Petroleum Corporation has long had a tenuous relationship with the residents of Southwest Detroit. 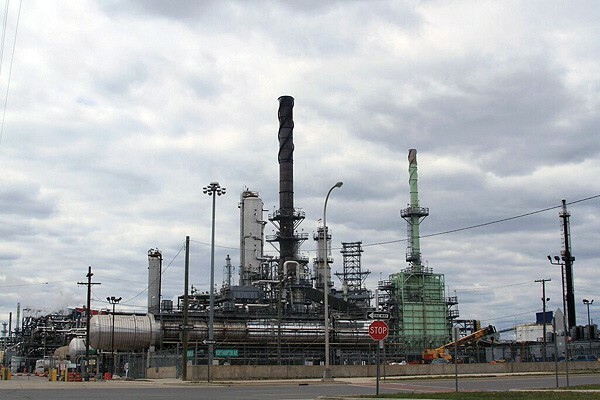 The zip code that Marathon’s Detroit oil refinery calls home, 48217, remains occupied by more than 7,000 Detroiters who suffer from higher rates of asthma and cancer than most of the country. Earlier this month, a malfunctioning flare at Marathon’s oil refinery at 1300 South Fort St. released foul chemicals into the air that, according to Marathon’s monitoring, were not toxic. Residents, however, reported cases of nausea, and Marathon later asked residents sensitive to smell to remain in their homes while the flare was repaired. The Free Press reported last week that Marathon is seeking special treatment when it comes to a 2017 city ordinance that places stricter regulation on the processing of the particularly harmful petroleum coke. In 2013, a video of a heavy, black haze of “pet coke,” a byproduct of the refining process, caused outrage and prompted legislative action. Records from the Michigan Department of Environmental Quality offer some understanding into the oversight Marathon faces from the state, and how the company manages to continually explain away the bulk of their alleged environmental violations. MDEQ has issued 13 violation notices to Marathon since 2013, and five of those were considered “high priority,” necessitating legal action. Most of the violations pertained to the release of excessive chemicals into the environment or excessive visible emissions, both of which violate Marathon’s permit as well as the federal Clean Air Act, according to MDEQ. In response to MDEQ’s allegations, Marathon most often denied the allegations on the grounds that the testing methodology was weak, blamed the violation on extreme weather conditions, or put the responsibility on one of Marathon’s third-party contractors. Since 2005, MDEQ has taken legal action against Marathon three times: in 2005, 2014 and 2016, ending in a settlement each time. The money from each settlement, none of which exceeded $100,000, are sent, by check, to the General Fund of the State of Michigan, according to the consent order agreements. Marathon emphasized their commitment to safety and efficiency in a statement to the Metro Times. As for the Feb. 3 Marathon flare malfunction that released a stench on Southwest Detroit, MDEQ is still investigating and has yet to determine if they will issue a violation notice. At a Feb. 4 protest, State Rep. Cynthia A. Johnson, who represents District 5 where the Marathon Petroleum refinery is located, alongside Rep. Rashida Tlaib called for greater oversight. Honor Sheard, environment, safety and security manager for the Marathon refinery, appeared before city council on Feb. 5, linking the malfunction to cold weather, an excuse Marathon has used on more than one occasion to explain past allegations. Built in 1930 by the Aurora Gasoline Company and purchased in 1959 by Marathon, the Detroit refinery is the only oil refinery in Michigan. It occupies roughly 250 acres, employs about 540 workers and can produce up to 140,000 barrels per day.